Summoning the maximum amount of fanfare it can muster, Nokia has launched their new Lumia 900 Windows Phone-powered handset in New York’s Times Square. The Friday night event featured ‘international superstar’ Nicki Minaj and a ton of clever CGI graphics and monster LED displays combining to send the crowd into gusset moistening raptures. NEW YORK, April 6, 2012 /PRNewswire/ — Nokia teamed up with international superstar Nicki Minaj to bring a building in Times Square alive and create one of the biggest LED displays ever seen to celebrate the launch of the Windows Phone-based Nokia Lumia 900. Tens of thousands of people watched as Nicki performed a medley of her hits before some of the world’s leading visual artists turned the prominent building into a living, breathing entity using cutting-edge CGI technology with 60ft waves appearing to cascade down the building. 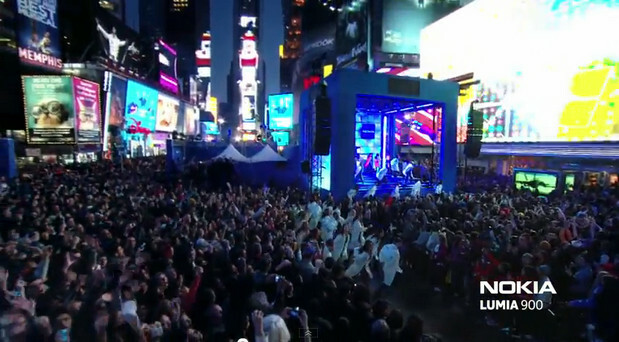 Nine of Times Square’s famous electronic screens showed the fantastic reaction of the crowd. 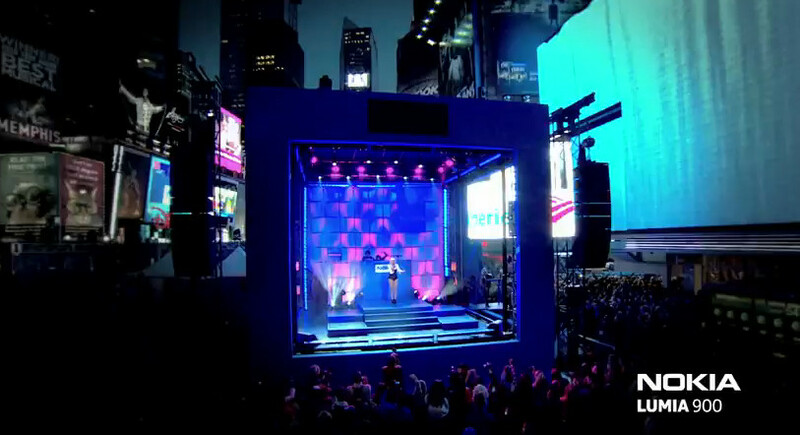 The unique visual event, to launch the Nokia Lumia 900 in North America, was choreographed to an exclusive Nokia Lumia remix of Nicki’s hit ‘Starships’, performed live by DJ and producer Doorly. The entire show was filmed as part of the singer’s new music video for the ‘Starships’ remix. Nicki said: “When Nokia came to me with the idea to make a building come alive and to perform in Times Square in front of my fans to celebrate the launch of the Nokia Lumia 900 there was only ever one answer. “To see the idea on paper was amazing but to see it for real blew me away. It brought Times Square to a standstill. The absolute bonus for me is that my fans, who have been so loyal to me, are now part of the video for the Starships Nokia remix. Nokia is a global leader in mobile communications. Every day, more than 1.3 billion people use their Nokia to capture and share experiences, access information, find their way or simply to speak to one another.